Do you ever dream of the perfect church, where everyone loves God and behaves themselves all the time? Wouldn’t it be awesome to not have to worry about dissenting viewpoints and conflict and wrong priorities? Imagine, a church without sin. What an awesome (and boring) church! In reality, we need lots of sinners in the church. In fact, we need lots of people in all stages of spiritual development. I don’t know about percentages. What would be a good mix? 50% Christians and 50% non-Christians? Or maybe 33% committed Christian, 33% carnal Christians and 33% sinners. The categories and possibilities are endless. The church is the family of God. Families are messed up. Even God’s family. Sinners need to be welcomed among God’s people. An atmosphere of acceptance and forgiveness must be obvious. 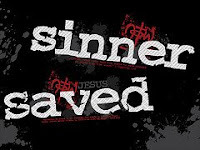 Let’s be reminded that the Apostle Paul referred to himself as “the chief of sinners”. If we are forgiven, it is by God’s grace alone. True, sinners need to repent and change. We can’t remain the same as we engage is the life of the church. But if there church ever closes its door to sinners – where will you and I worship? Tonight in our small group, we had a great discussion on one verse found in Galatians. “I have been crucified with Christ and I no longer live, but Christ lives in me. The life I live in the body, I live by faith in the Son of God, who loved me and gave himself for me.” (Galatians 2:20 -NIV) It was interesting to hear what these words means to various people. As is usually the case, God used His Word to say just what each of us needed to hear. God is speaking to me about dying to myself in some specific areas. It is my natural tendency to focus on physical things rather than spiritual things. This usually runs in cycles. At times, the things of God rise to the top of my life in simple fashion. It is easy to find my stride. Then there are the other 364 days of the year. Paul said in 1 Corinthians 15:31, “I die every day”, which means that this Christian life is a continual process of self discipline. I wish that this were not necessary. I wish I could just make the decision to do things God’s way and that would be it. But it is a battle. It always has been and it always will be. The good news is, the battle is not mine. It is not a matter of making up my mind or working hard to get the job done. It is a matter of trusting in God’s grace. He will do what I can’t. It is my job simply to cooperate with him. This is “Christ living in me”. This is only available as “I am crucified with (Him)”. Life is too short to play it safe. “Safe” isn’t all is it cracked up to be. “Safe” is the land where dreams are buried. “Safe” is risk free and adventure free. “Safe” is where we live when we are too frightened to move ahead. Today holds opportunities and possibilities to do something important. But if you are going to do something important, you will need to be ready to move out, away from your safety net. You will have to be willing to get close to the edge, you will have to come to terms with your fears and overcome them. This is what it means to “live by faith” (2 Corinthians 5:7). Life expectancy in America right now is 69.3 years. Do the math. If you are half way there, are you half way to meeting your life’s goals? When I am old, I don’t want to look back and regret living my life in a comfortable place. In fact, I really want comfortable to become uncomfortable for me. I hope I have enough courage to walk by faith, embrace the risks and move away from “safe” – right now. Our daughter Jessica and her husband Josh leave today, moving to Guatemala to spend a year working at Casa Shalom orphanage. It is an exciting day. Lots of prayer and planning have gone into the move and God has worked out all of the details (as many details as can be worked out as you do missions work). Admittedly, Letha and I are sad. It is never easy to say goodbye to those you love. Interestingly, we will be closer geographically that we were when they were in Knoxville. This brings us some comfort. We do plan on amassing some frequent flyer miles to Central America! Thanks to everyone who is supporting these guys through prayer and finances. You can find out more about their work at thehansonsinguatemala.blogspot.com. I have prayed more for Jessica that I have any other person. 24 years of prayer. I believe that God has plans for her. I believe that this is one of the most important and significant steps to her discovery of His plans. It will be awesome to watch it all unfold. Jess, we love you and are proud of you. Go with the fullest confidence that God is going before you and we are behind you. My dad is one of a kind. He’s 83 now but still as tough as they come. He has struggled with serious health issues for the last 30 years but has survived. I learn a lot from him. He didn’t go very far in school and never did anything but manual labor to make a living. But I learned about character from him. He has incredibly high standards for what it means to follow Christ. He is pretty much old school – doesn’t think in terms of progressiveness – but he is solid as a rock. Steady, unmovable, strong. In some ways, I find myself more like him that I am comfortable with. He is stubborn and finds it difficult to forgive. Once you have lost his trust, good luck regaining it. He has been known to be a little harsh in his judgment of others. He struggles with loneliness. These things are showing up in my life. But I really hope I can inherit his stamina, his courage and his inner strength. One more things about my dad, he loves his kids fiercely. I mean he thinks we are the best ever. Please don’t tell him the truth – you will have a fight on your hands. I’d hate to see you get whipped by an 83 year old! And my money’s on him. I had a very neat experience this evening. Four new believers from our church wanted to be baptized in water. This is something we had planned a few weeks ago and there was quite a bit of excitement surrounding the event. The thing is, the weather got really nasty around here. There was a lot of rain and lightning most of the day. As the scheduled time of 5:00 PM got closer, I thought we may need to reschedule. I wasn’t crazy about being around water with lightning in the sky. We got to the beach only to find out the beach was closed to the public. The lifeguard let us know that we couldn’t go in the water. The conditions were not favorable. These new believers would not be deterred, they wanted to simply move down the beach and get on with it. So we did. I have never been in such a rough surf. The waves knocked two of them down as soon as we got in the water. It was pretty dangerous. It was raining and we were bouncing all around. But we got the job done. This evening about 5:20, we baptized 4 people who were making a public declaration of their faith in Christ. It was one of the best baptism I’ve ever been a part of. It would have been very easy for us to back out and wait for nicer weather. But I think their insistence on going through with baptism is an indication of their faith commitment. Even in the face of inclement surroundings, they are moving forward. I think there are some good things in store for these four. Francis is a bit of a radical, in the positive sense of the word. He speaks clearly and concisely and is not afraid to tackle tough topics, speaking truth. If you track his story, you will find that he is a risk taker. That probably is my favorite quality of his. I think that fearlessness is a vital characteristic of anyone who wants to bring change to the world. I hope you have a few minutes to check out some of what he is saying. He also has a new book out, Crazy Love, that I hope to pick up in a few days.